Tyreke Evans scored 14 points for the Pacers. SALT LAKE CITY — Myles Turner missed Indiana’s last game with a sore ankle. He returned with a rested body and renewed determination against Utah. If the Jazz got past the ball pressure, Turner was there to turn away drives in the lane. On offense, the Indiana center made his first five shots, mostly on mid-range jumpers off pick-and-pop action. After a four-game stretch in which he scored no more than nine points, Turner has reached double figures in five consecutive games. “This is how I should be playing every night. I’m going to miss some shots and make some shots, but that can’t determine the way I play out there. I’ve got to bring it,” Turner said. Pacers: The Pacers beat the Jazz 121-94 last Monday. “Our two most complete wins are both against the Jazz,” McDermott said. … Indiana is 8-0 when making at least half of its field-goal attempts. … The Pacers had their largest margin of victory this season and their first 30-point-plus win on the road in 22 years. 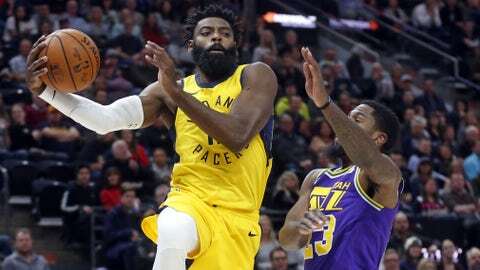 Jazz: Ricky Rubio had 23 points on 10-of-13 shooting Sunday against Sacramento but just three points on 1-of-6 shooting against the Pacers, typical of his up-and-down season. … Thabo Sefolosha and Ingles both got technical fouls. … Utah went 8 for 31 on threes.